生徒さんのおうち作品NO.23☆　偶然出会ったステキな生地で服が作れるヒトになりたい！ ☆　Want to be a person who can sew quickly. How long should we buy the fabric for a skirt? 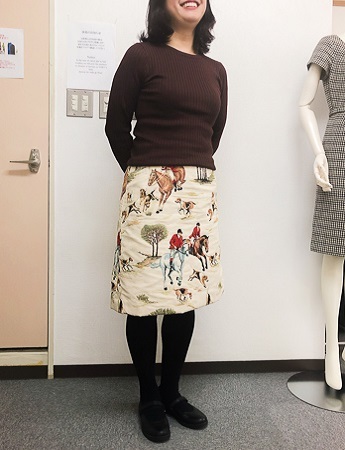 It depends on the size of the hips and the waist, but in the case of a basic semi-tight skirt, the fabric you need is 110cm wideth × 2 lengths / 140cm widethe × 1length (Including seam allowance). Be careful, because you need vent to sew a tight skirt. So purchase the required amount of fabric. *A tight skirt can not walk without a vent./ Semi-tight skirts can walk without a vent.